The highest Court of the European Union this morning found that EU's trade agreement with Morocco cannot be implemented in Western Sahara. The EU Court of Justice today made its final say on the issue of an EU-Morocco free trade agreement signed in 2012. The news was broken on the website of the court at 10:30 this morning. The judgment itself is published here. The decision is clear. 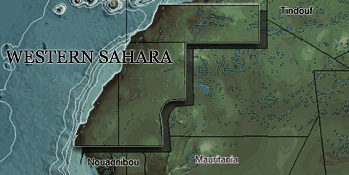 The trade agreement cannot be implemented in Western Sahara, which falls outside of the international borders of Morocco. However, the court does not stop there. In its decision, the judgement goes even further, all the way back to the 2000 Association Agreement which frames the EU-Morocco relations. That agreement too, the court states, cannot be included in Western Sahara. The reasoning follows the line of arguments by the general-advocate of the court who in September 2016 came to the same conclusion. The court thus goes even further than the original judgment from 2015. "It is not apparent that that people consented to the agreement being applied to Western Sahara", the court stated in a press release. March 2000: The EU-Morocco Association Agreement enters into force. A free trade area liberalizing two-way trade in goods was created. October 2005: The Council gives the EU Commission the mandate to negotiate further trade liberalisation for agriculture and fishery products. October 2012: The FTA is expanded to include reciprocal liberalisation measures on agricultural products, processed agricultural products, fish and fishery products. November 2012: the liberation movement of Western Sahara, Frente Polisario, brings action against the Council of the European Union, calling for the annulment of the 2012 extension of the FTA. December 2015: The General Court rules the partial annulment of the Free Trade Arrangement insofar as it covers Western Sahara. February 2016: the Council appeals the General Court’s decision. September 2016: The EU Court’s Advocate General concludes in his Opinion that “neither the EU-Morocco Association Agreement nor the EU-Morocco Agreement on the liberalization of trade in agricultural and fishery products apply to Western Sahara”. 21 December 2016: The Court of Justice of the EU, in general, confirms in its final appeal the argumentation of the Advocate General and annuls the initial judgement from December 2015. The reason for annulment is that Western Sahara has no part in the application of the 2000 and 2012 agreements. "This is a wonderful victory for the Saharawi people and for those who advocate for respect of international law in Western Sahara. The EU Member States which over so many years have advocated for international law in the territory are now proven right. The EU now has to abide by the law in its relations with Morocco, and not put obstacles to the UN peace process in Western Sahara as is the wish of Morocco's main ally, France", stated Erik Hagen of Western Sahara Resource Watch. The decision came after EU had appealed a judgement by The General Court of the EU Court of Justice on 10 December 2015. See full timeline in the box. Even though all states joined the original appeal in January 2016, there was a division within the EU on the applicability of the agreement on Western Sahara goods. Sweden and Netherlands had been most outspoken, stating that no Western Sahara produce can be introduced to the EU as Moroccan. In June 2012, WSRW documented how produce from agro-industry in occupied Western Sahara ends up in the baskets of unaware EU customers. The products are made on plantations owned by the Moroccan King or French-Moroccan conglomerates. WSRW's research also demonstrates that the agro-industry in the territory particularly boomed after 2005 - the year the Council mandated the Commission to negotiate further liberalisation for agriculture and fishery products with Morocco. Polisario has one other pending case before the EU's General Court, calling for the cancellation of the EU-Morocco Fisheries Partnership Agreement in the Western Sahara territory. The Court is expected to start proceedings in the coming months.